Yesterday, I was in downtown San Diego with an unexpected 1 ½ hour break as court recessed for lunch. Yes court, because yours truly had her first crack at the beloved jury duty experience. 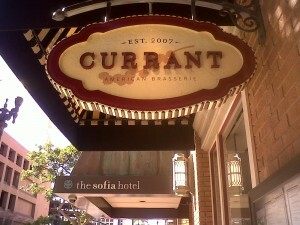 * I had decided an hour earlier, as my stomach began to rumble over the judge’s Q&A with the potential jurors, that if my day was going to be a wash, I might as well treat myself to a fabulous lunch to make it worth my while…and that is when I found myself drooling over the menu at Currant at The Sofia Hotel. A short walk away from the courthouse, right in the mix of downtown San Diego’s busy Broadway Street, I was seated in the shady outdoor patio at a relaxing table with a carafe of fresh water and too many delicious lunch options. 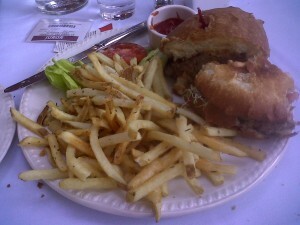 After some debate, I settled on the Turkey Burger with avocado, tomato, seasonal sprouts, chipotle aioli and thyme fries, and to make sure I got my veggie fix (and because this lunch outing was going to be the highlight of my day), I splurged a bit and added a side of Fiery Brussels Sprouts. The verdict? Delish!! 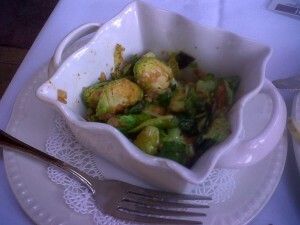 The burger was wonderful but the brussels sprouts stole the show. I plan on returning to Currant in the very near future to try some of the other lunch items that caught my attention like the Hanger Steak Salad, Calamari ProvenCal and Garlic & Chive Tots. The moral of the story: Passing-up the opportunity to dine at Currant is inexcusable and is a crime punishable by law, so please take my advice and stop by for brunch, lunch or dinner and give us one less reason to be summoned for jury duty. *In all honesty, jury duty really wasn’t bad. I didn’t get picked for the trial, but I appreciated the experience and found it quite interesting. Kudos to Judge M.G. for making the process enjoyable. 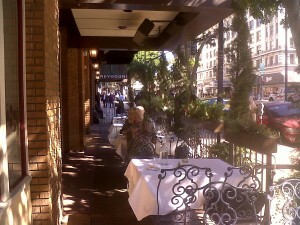 This entry was posted in Insider Tips and tagged dining, downtown, lunch, restaurant by Stephenie. Bookmark the permalink.